This is the kind of story everyone wants to read at Christmas time—one of the hope and steadfast love between a child and his best friend. But not just any child or just any best friend. Read on! Although a study made last year revealed that the average person may have only 4 best friends in a lifetime, most people feel lucky to have just one. But this isn't about an "average" person. Meet Kian and Simba! The story actually began seven years ago when Kian's parents brought home a Persian kitten for their son. 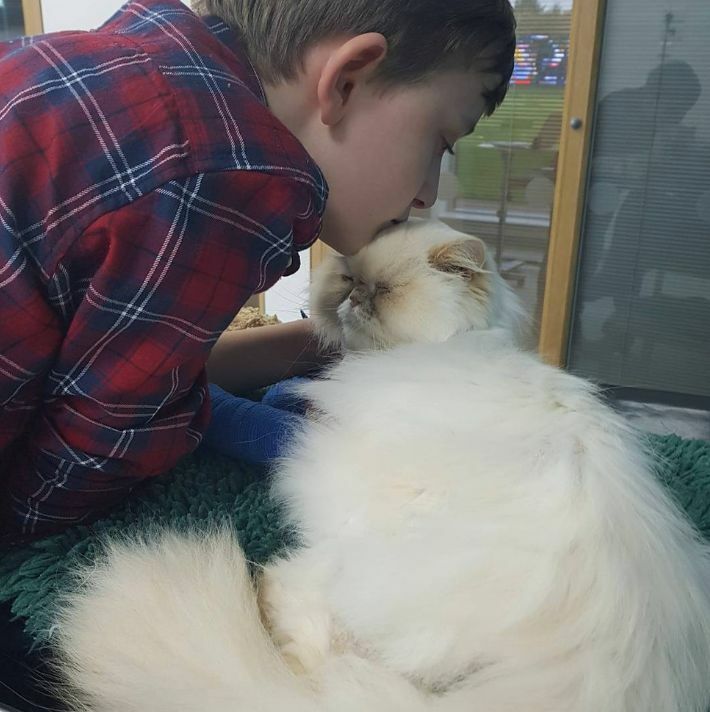 When the boy met the kitten, something amazing happened. You see, Kian is not an ordinary boy. "He has autism, secondary immunodeficiency syndrome, and degenerative bones and soft tissues," Becky Green, Kian's mother relates. That's a pretty grim list for the son that they love so much. It didn't take long until Simba, as they named the kitten, grew into a beautiful cat. That's not unusual at all unless you take into account the fact that Simba can anticipate Kian's problems. For instance, he regularly stops breathing with no warning signs, no matter what he is doing. "He once was walking along and just fell like a lead weight to the floor unconscious," Becky said. But Simba recognizes when Kian is going to have trouble and alerts his humans. That gives them time to get prepared. Kian often screams and harms himself, but Simba can calm him, touching his head or hands to stop Kiam's harmful actions. Then, on October 9th, the worst happened. It was morning and Becky had to get her other children organized and out the door to school. During the transition, Simba managed to slip out the front door. Becky's mother called and called, but Simba didn't return. And then, Becky received a Facebook message that sent her flying home as quickly as she could. 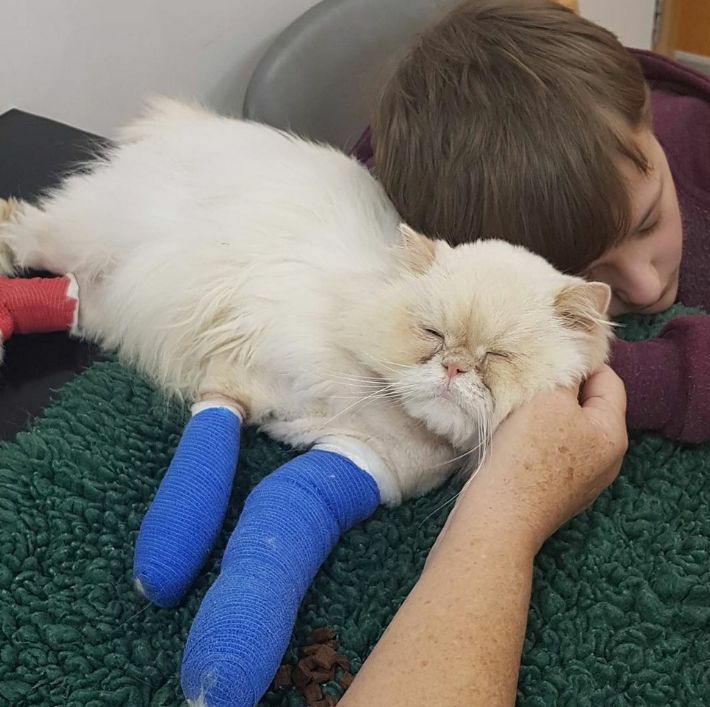 Simba had been hit by a car. "I drove home as fast as I could and when I called him he tried to rub to me but his legs were so mashed up, facing the wrong way…. I picked him straight up and ran to my car. 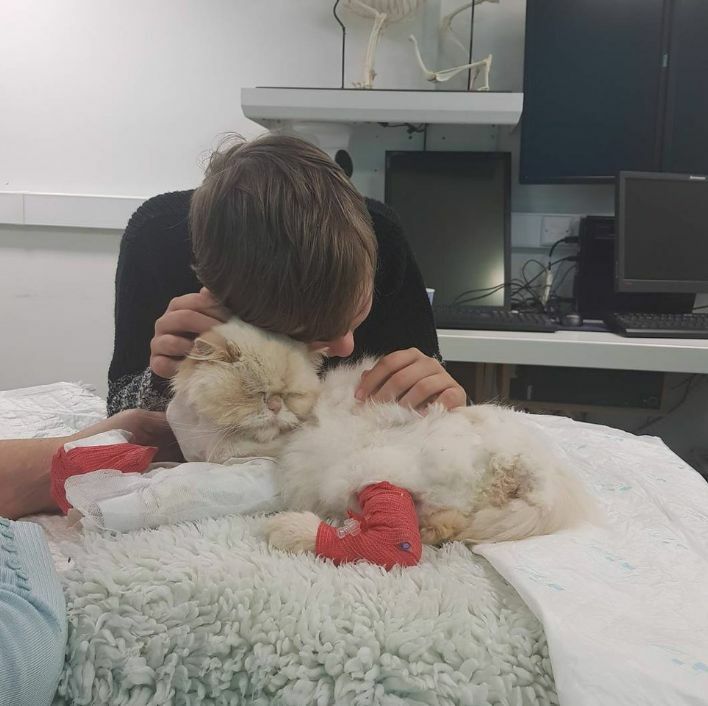 My mum sat in the passenger seat holding him and he purred and purred like a lion," Becky said. 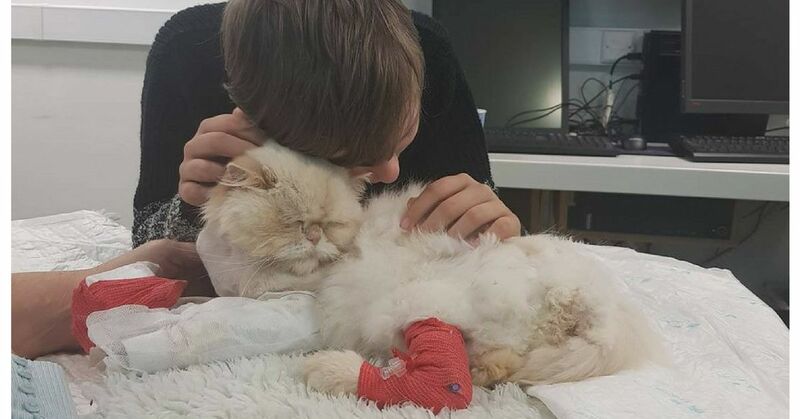 He was in terrible pain, but he knew he would be alright with his humans. Although Simba had no internal injuries, both his front legs were extremely damaged. 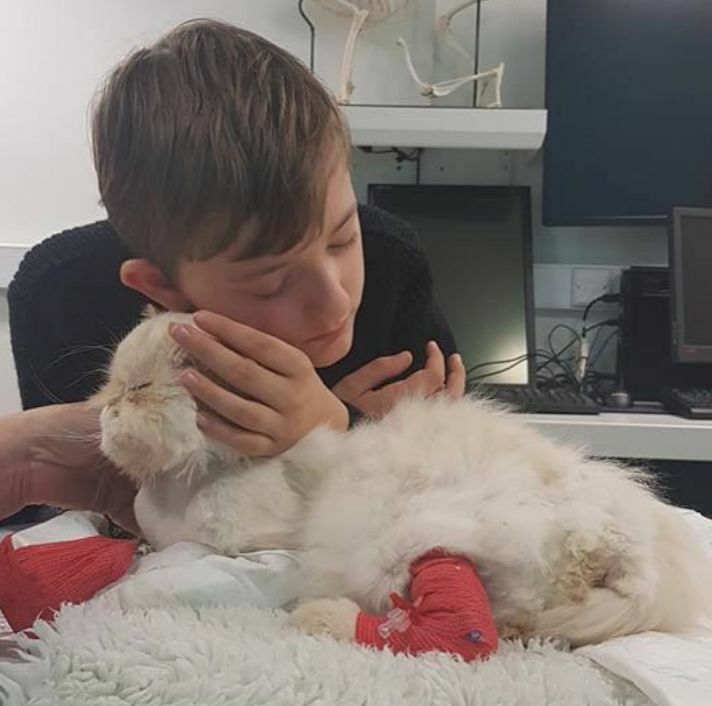 They were so badly injured that the vets recommended they take Kian's best friend to specialists. Maybe they could help him. The specialists were not hopeful and even thought Simba should be put down. They suggested that Becky get Kian another cat. Upon hearing that, Kian began to scream hysterically. 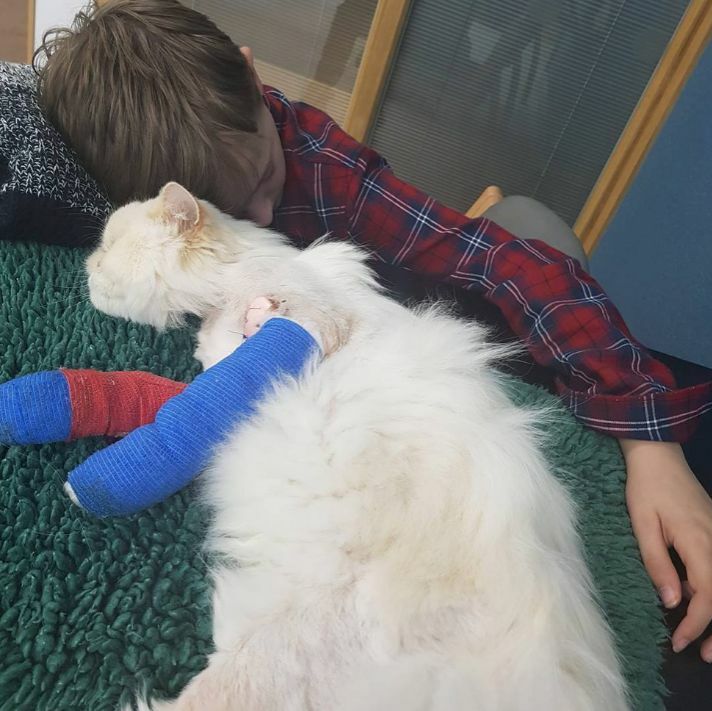 He lay on the floor and begged the vet to save his pet. 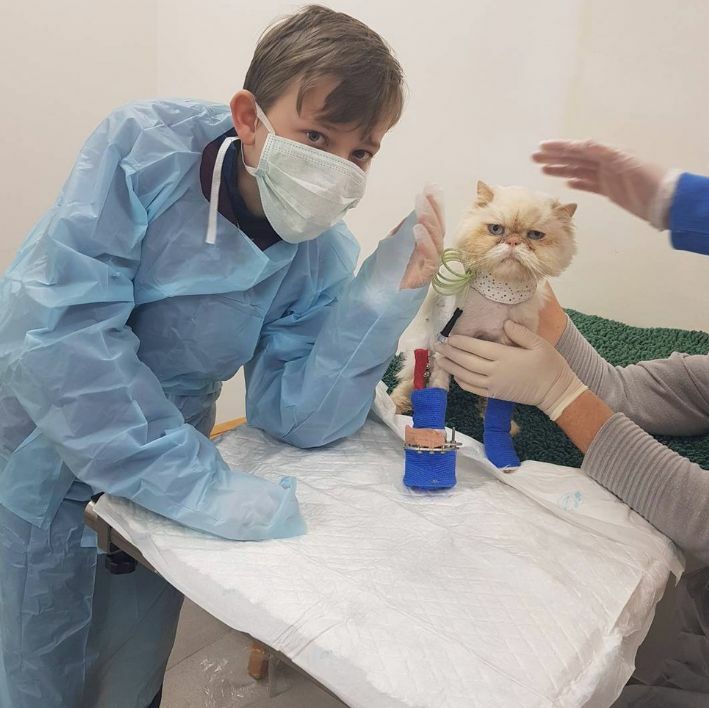 Finally, the surgeon suggested they take Simba to a specialist. She still didn't hold out much hope. Kian was inconsolable. When Simba tried to push himself across the floor to get to the boy, Becky knew that no matter what, they needed to try to save the cat. So the following day, Becky called Professor Noel Fitzpatrick, a world-class orthopedic-neuro veterinary surgeon. Then the miracle began. 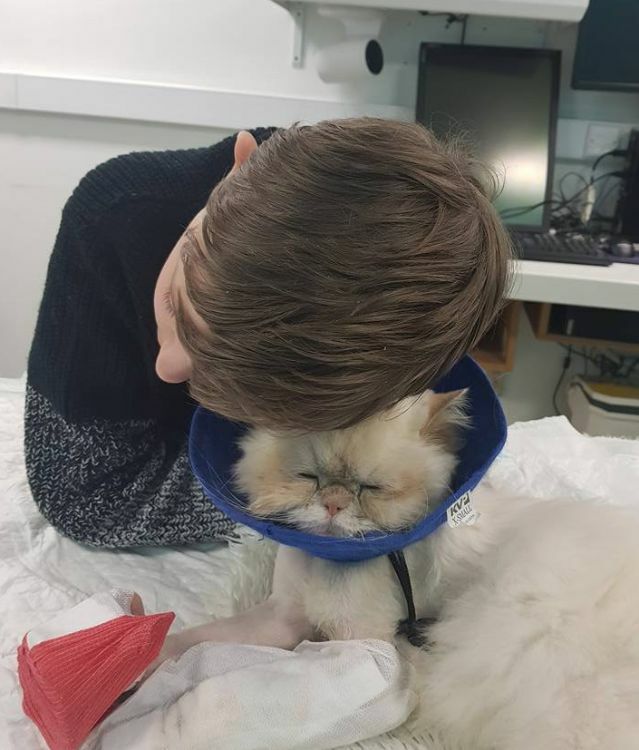 Simba has been in the vet hospital for many weeks now. During that time, he has undergone numerous surgeries for skin grafts and using bone reconstruction techniques that only these specialists do. They try to visit Simba as often as possible, driving 260 miles round trip to see him 4 or 5 days a week. Soon though, Simba will be home. He'll need to be crated while he heals, but every day Simba tells them, "Hey, I'm still here, still fighting. Don't give up!" Simba needs Kian, and Kian needs Simba, too. Even if the whole world gives up on Simba, one little boy never will. Christmas time is an expensive time for most people. This year, the Green family have even less money to celebrate the holiday due to Simba's vet bills. If you would like to donate to Simba's medical expenses (which have topped $13,000), you can go here. 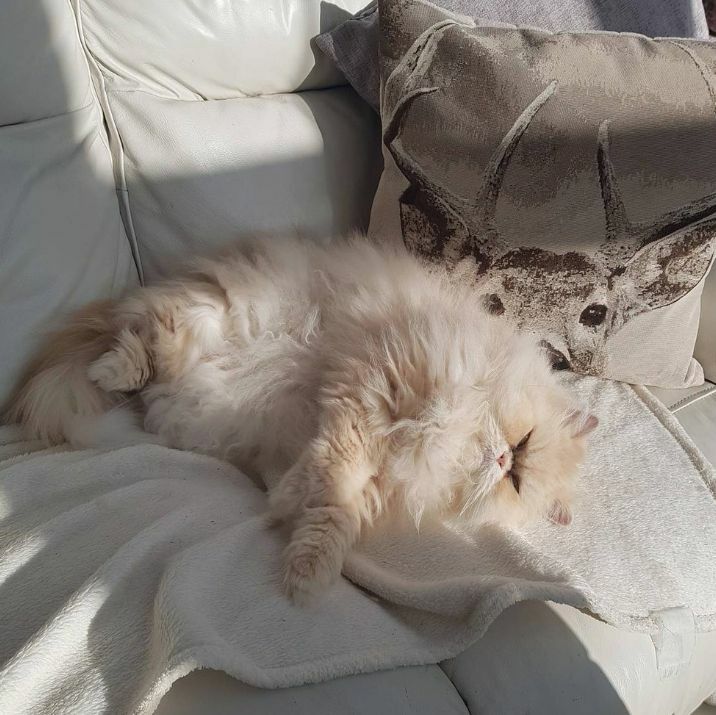 To see how Simba is doing, check out his Facebook page. Then share his story with your friends. Together, we can make Kian and Simba's Christmas truly joyfully!